I’m sure it’s not the first time you’ve heard this. The hardware that is responsible for displaying your content to the world is therefore one of the most important pieces of the puzzle. Creating seamless and reliable playback will not only help deliver information to your audience in the most efficient way possible, but also help reinforce your company’s brand. Unresponsive and interrupted content will only weaken the impact of your digital signage. What content do you wish to show? How do you want to manage the device(s) within your digital signage network? What is the installation environment? Step 1) What content do you wish to show? What file types will make up the content? What type of layout are you designing i.e. multi zone or single zone? Is the content going to be interactive? Step 2) How do you want to manage the device(s) within your digital signage network? Will you need to remotely access the device? Are you close enough to see the device / display? Will you need to update software / firmware versions on the device? Step 3) What is the installation environment? Indoors, outdoors, on a wall, in a window, from a ceiling, in a walkway, on a table etc. Does the device need to run 24/7? Step 4) What is your budget? Is that budget realistic for what you are trying to achieve? Got the answers? Now what? Once you have answered these questions, you are then able to begin looking at the range of devices available to deliver your digital signage objectives. Perhaps content performance and remote management are the most critical to your network? Then maybe you need to adjust your budget to match those critical needs or compromise in certain areas? By planning your requirements from the outset, you are empowered with the knowledge needed to find the perfect balance or ‘sweet spot’ for choosing the right digital signage hardware for your network. Further hardware examples; Starting fresh? Samsung’s Smart Signage Platform (SSSP) displays are considered to be good ‘all rounders’ for a digital signage network. They offer good value for money with a media player built-in to a commercial grade screen, 3 year warranty and performance to deliver the majority of content playback. They range from 10″ to 82″ and offer a variety of brightnesses to suit various installation environments. Paired with embed signage you can manage SSSP devices remotely, update firmware, get live screenshots as well as creating multi zone layouts consisting of a variety of media formats. 4K content & video walls? Running 4K content or a video wall? An external media player is going to be needed. There are a variety of 4K UHD ready devices including Android, Windows and ONELAN but also consider what processing power will be needed. If it’s just single zone imagery with the occasional video then maybe Android will work for you. If you are expecting much more processor intensive content such as CSS animations and live data integration from external sources then looking to the commercial-grade Windows and ONELAN media players would be the way to go – both of which provide access to remotely manage the devices via additional software. Need to make your content interactive? For interactive content such as digital ticketing or product catalogues, smaller devices like an iPad or iPod may be suitable to use when run in guided access mode. Multiple Android devices could be used for digital signage, although focusing on the ‘commercial ready’ devices for signage projects could yield more satisfying results than consumer devices. Maybe you want your interactive content to be much bigger? Larger touch screens, such as ELO, are a good choice. These displays allow you to pair them with an external media player or an OPS Windows player giving you the flexibility to ensure the ‘power’ behind the screen is going to deliver your content effectively. Many businesses already have displays and do not necessarily need to replace the old with new when expanding. For these cases, using external media players are certainly the way to go. Now, armed with the answers to the original four questions (content, network management, location and budget) it’s time to identify the right type media player for your project (and there are lots to choose from!). If your looking for powerful content playback, remote network management and budget is not restricted then using high end Windows based media players with third party remote management tools could be an option. Also consider the extremely reliable ONELAN digital signage media players with the addition of the ONELAN Digital Signage Manager product for remote management. Where the focus is for reliable content playback of multiple media formats (images, HD video, Twitter etc) yet there is a restricted budget, then maybe consider the Windows based Intel Compute Stick or NUC. For very simple content i.e playback of images / text and a low budget then consider a using entry level Android mini PCs. How about making use of what you already have? Maybe you already have a Windows PC or Mac available to you? If so, perhaps you might want to consider these devices connected to a display for your signage? Maybe for smaller installations where the business owner has direct and instant access to the device itself? Planning your digital signage network before investing in it, is critical. Focus on answering the four steps of Content, Network Management, Location and Budget so you can identify what your objectives are. From there, you can narrow down the hardware specifications based on what is most important to you. 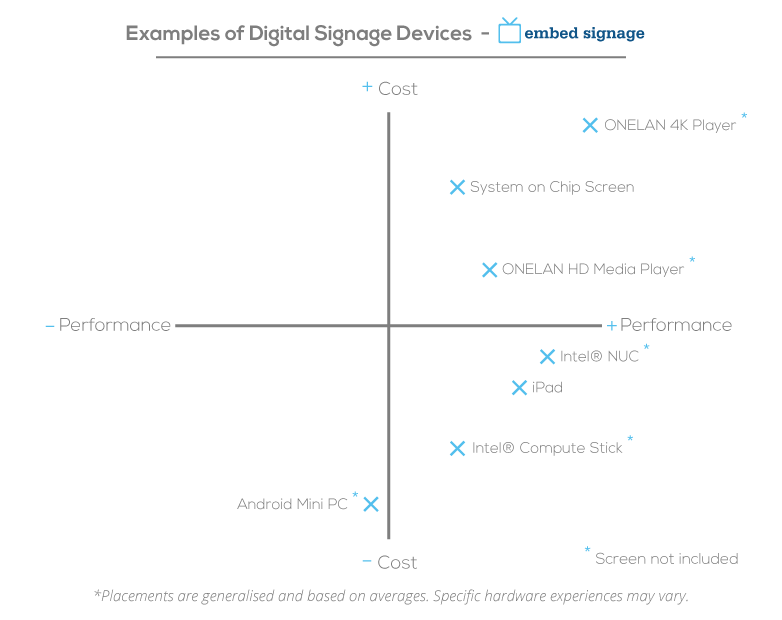 If you choose embed signage as your digital signage software provider, you will open up your hardware choice to a vast range of devices for you to display your content on. See the device platforms that are currently supported with embed signage. Maybe you would like to discuss your digital signage objectives with us before you start? We are happy to talk through your project and provide professional guidance on hardware choices to help you find the right balance for your network. Speak to the embed signage team here. Sign up for your free 28 day trial and see how embed signage.com can deliver your digital signage content to your device.